"Uchitesia Brati Moyi!" "Learn, My Brothers!" But your own never spurn. Love of learning characterized the life of the Ukrainian settler. Continuing the tradition of co-operatives and self-help groups to accomplish cultural and educational aims as in Ukraine, the early pioneers organized classes in newly-formed parishes. They used the means they had to teach their children to read the Cyrillic alphabet and perpetuate their culture. The formation of school districts, some with after-school sessions for Ukrainian language, brought educational interests to the foreground. was useful. 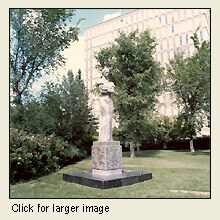 Teachers organized as well; the first conference of Ukrainian teachers in Saskatchewan took place in 1910. 1915, six students of Ukrainian descent were at Canadian universities. However, attempts within Saskatchewan to assimilate the “New Canadians” through the promotion of British ideals, particularly after the 1914 –1918 War, had to be counterbalanced by the formation of live-in Institutes for young students, a main one being the Petro Mohyla Institute formed in Saskatoon in 1916 The Institutes (located in Alberta, Saskatchewan, Manitoba and Toronto) provided a place for a student to receive room and board, and continue with his or her higher education while interacting with others within the Ukrainian culture, and, of course, making friends with other young Ukrainians. Savella Stechishin was the first Ukrainian woman graduate from University of Saskatchewan. Both she and her husband, Julian Stechishin, were much involved with the Institute, the church and intellectual pursuits. An important development in education involved the formation of various cultural organizations, including museum work within the Ukrainian Women’s Association of Canada, various Ukrainian youth organizations and religious-political organizations, which provided fertile ground for Ukrainian ethnic consciousness. Through academic friends of the Ukrainian community, such as Professor George Simpson, steps were taken to formalize Slavic Studies at the University of Saskatchewan. In 1944, Professor T. K. Pavlychenko, a botanical engineer, taught the first course of Ukrainian studies in language and literature at a Canadian University. The first-ever department of Slavic Studies in Canada was formed at the University of Saskatchewan in 1948. In 1952, Ukrainian language became a regular high school subject in Saskatchewan. . Since then, education has remained a notable field for Ukrainian-Canadians, with a rich contribution of University faculty who have been Ukrainian origin, vast numbers of Ukrainian-Canadian students who have been educated here over the years, and academic exchanges between the University of Saskatchewan and Ukrainian universities. 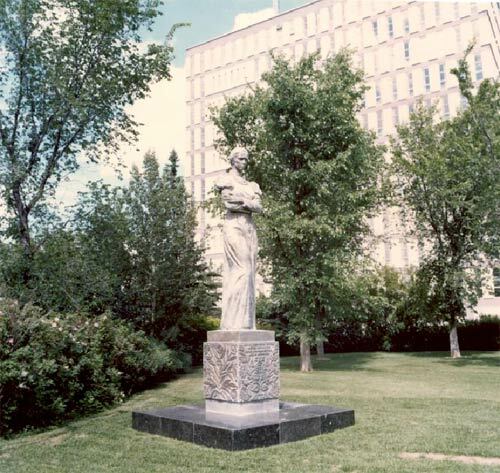 In 1976 a ten-foot high, bronze statue of Lesya Ukrainka, the celebrated Ukrainian poetess, was presented to the University of Saskatchewan by the Association for Cultural Relations with Ukrainians Abroad of the USSR as a gift of friendship from the people of Ukraine to the people of Canada.